sheep on wheels. after struggling with all sorts of unsatisfactory legs I decided to make a big flatish sleeping sheep. they are awesome. another really great modern take on a vintage toy from you. you are amazing! wow, i love them , i love them, i love them….don’t you want to teach me how to sew? i bet oscar loves them-that is if you let him touch them!!! my pearl would wan t to play with them non-stop!! How creative! I love them all! I think the sheep is so funny! And the picture on top is the best! 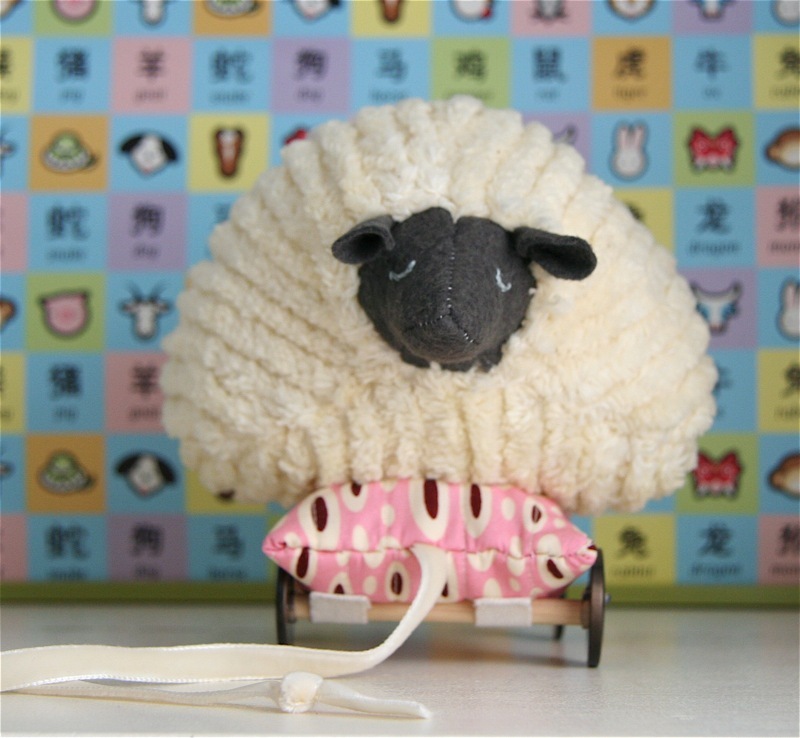 I looooooooooove the sleepy sheep. He’s just darling! I want to smoosh him with hugs. What a beautiful set! Lucky for us you like making sets so we can enjoy your creativity. i have to comment again 🙂 (see flickr) I love them, they are soooo cool. My favorite is the bear 😀 I love his fat body and skinny legs! 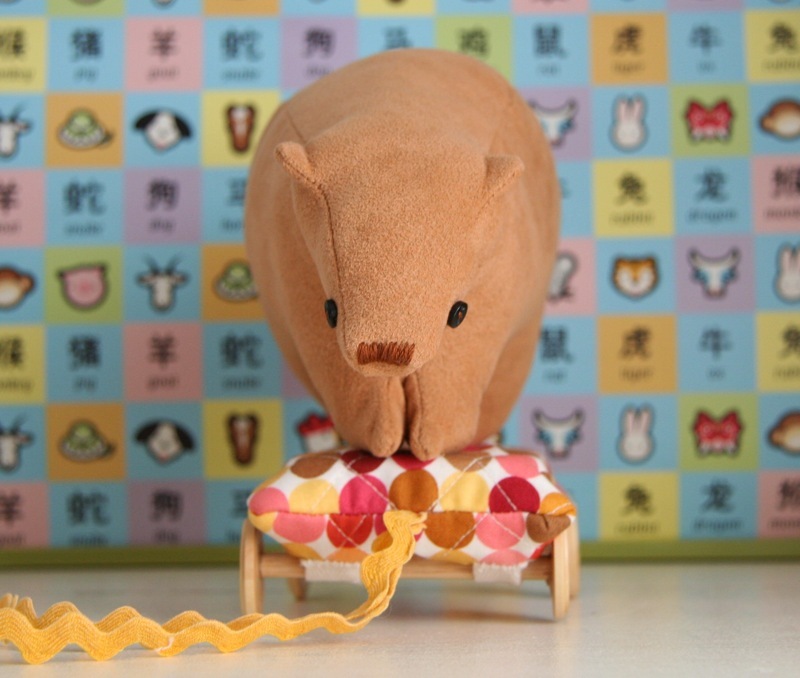 And the hugely round pig is great too! Oh my gosh, they are so so adorable. I just love them all. The piggie is my favorite I think, but the sheep, oh the sheep. So cute. Very charming! I like the clever use of chenille for the sheep. man!! man!! so, are you going to sell these, becasue I hope you are–and wow! sorry, can’t really stop saying wow! !will stop typing now. I have never said this on the internet before (not even at cuteoverload): “SQUEEEEE!” (faints from terminal cuteness). I ADORE that little piggie! Is that velvet? You did a great job with all of them. I really can’t wait until your book comes out! they are so cute i can’t look directly at them. i have to avert my eyes. i keep scrolling up and sneaking looks. seriously, i am blown away. beautiful design. are you making them for your shop? TELL. ME. that you will offer her for sale, or a pattern for her? ohpleaseohpleaseohplease? So cute, it slays me. You’re amazing, and you inspire me so much! I’m there with you: never just one. There always has to be a friend (or two…or three) and a backstory, and a set of accessories. The sheep kills me. Also- thank goodness for your need to make sets because the cuteness leaves me cheered for days! they are so, so delightful! i’m blown away. your creations always make me smile. indeed, one little guy was not enough. These are just terrific! The face on that sheep is hilarious for some reason, and the pig – oh, the pig! Excellent work. I love them all! 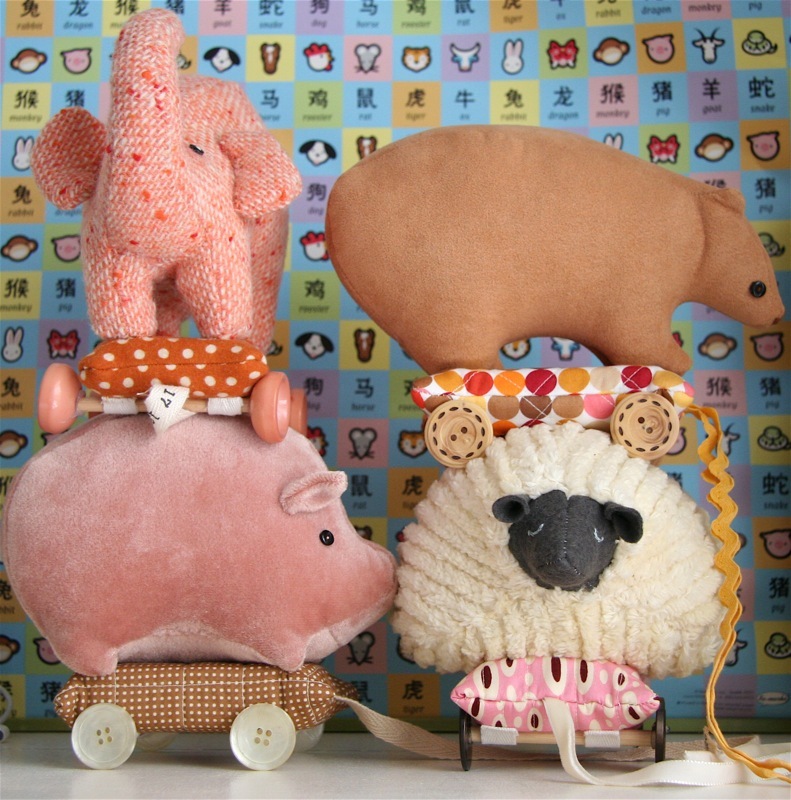 They are so precious, but I think my favorite has to be the sleepy sheep! Oh my goodness! I just want to hug and squeeze those!! Adorable! Good work — great toys. You should do a pattern. Will you be selling any of your wonderful creations?? you are amazing. i love that drowsy lamby. Gotta love ’em all! You go, girl! good god lady… it really should be illegal to make something that sweet. i am in love with that pig… and the sheep, oh who am i kidding? the whole lot! there i said it, i am in love with a stuffed object. absolutely amazing. i love them all! Are you going to put any of them in your pattern booklet, or is it too late for that????? Could that pig be more cute? Can you roll him over here? Are you trying to kill me?! These are too adorable for words. I second the mention that there’s very clean and contemporary. It pains me how adorable these are! So cute it hurts… Your ideas are both creative and unique…. I am inspired by you every day! If you didn’t notice, we love it when you make sets! How fantastic that you can take something you’ve created and tweak it to create four different-but-a-little-the-same somethings. And are they adorable somethings or what? I love the pig but I think I still love the elephant the most, he is tweedy after all. Amazing! They are all absolutely precious! love them! That sheep is too cute! OMG. love them all hillary. The genius just keeps coming through. good grief! 🙂 i want the whole pack/zoo/barnyard! You are Amazing! Thiose guys are great! I still love love love the elephant!!! That is such a cool playset I can’t get over it! These are seriously the cutest most lovliest things ever!!!!! I adore them!!! They are all awesome. WOW. I love the sheep! Very cute! I’m an Australian saying I love sheep… how predictable *G*. How fantastic. They are the best toys on wheels I’ve ever seen. You always amaze me!!!!!! I just love the little pig and I still love the elephant! hi hillary…i totally make things in groups as well…thanks for the comments on my blog…and you should get that rug you commented about…i am loving it! I love the pig so much. You are amazing! I cannot decide which one I like the best. Oh wow! These are astoundingly good! I LOVE the big sheep…he reminds me of a pet sheep called Benny my aunty had when I was a kid. He was wide and very docile. He could stand as much patting as he could get, and always had a sleepy blissful look in his eyes! they’re all so darling, but I think the elephant is still my favorite. Me again — still loving these toys! On an unrelated note, I made some shrinky-dink pins that you’ll get a kick out of — f a m i l y p o r t r a i t s ! I just put the post up. My son even got in on the action. I’m in love (with the toys, ahem). 🙂 You inspire me…and also remind me how far I have to go. Great work! Martha is berating her staff right now for not coming up with something this cute in years. And she’s wondering why you don’t work for her. I really like the face of the sheep! I love your original inspiration for these and how you’ve given them form. Just wonderful. Really fresh and unique. THey are SO Cute! I love the furry little pig. Very fun toys. Love the sheep SOOO Cute. 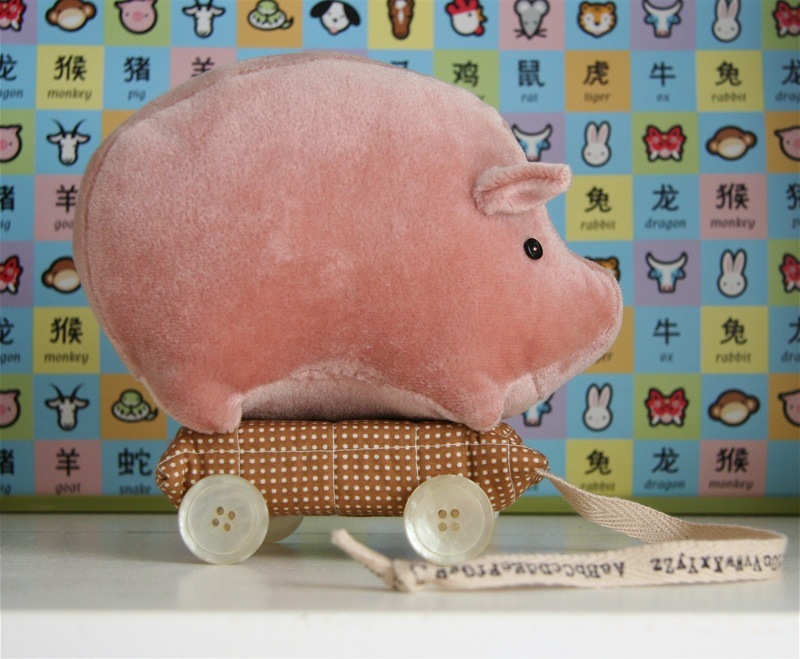 I’ve always loved animals on wheels, and these are some cuties. My favorite is the elephant. Geez! You are killing me here! They are all so cute and perfect! Fantastic work as always! you are so creative!! would it be too much to say i love you?! Using Wrapping paper for a back drop is a really great idea, and as always those little guys are so cute!